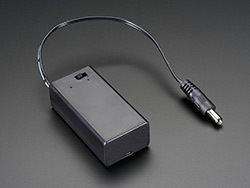 Description: This is a 9V battery pack with on/off switch and a pre-attached 5.5mm/2.1mm center-positive barrel plug. Use this to battery-power your Arduino (or other electronic projects) - it's ready to go out of the box! Note: Battery & screw not included.